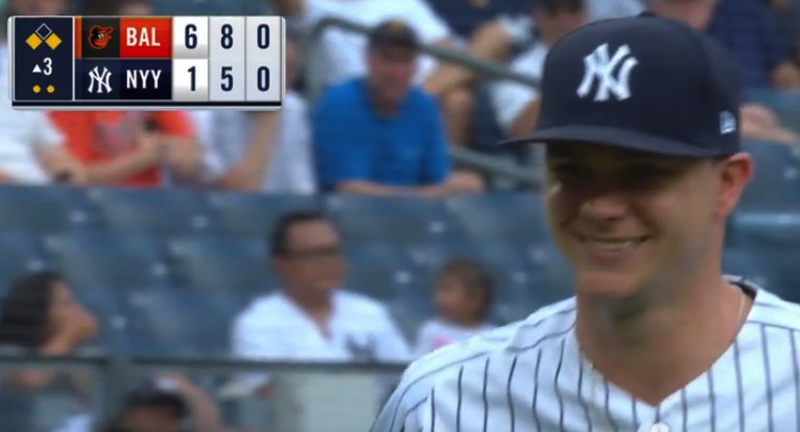 The 'juggernaut' that is the Baltimore Orioles scorched Yankee starter Sonny Gray for seven runs in 2.2 innings and hung on for a 7-5 win over The Bronx Embalmers this afternoon at The Concrete Bunker On 161st Street. It was just the 33rd win of the season for The Birds—and they now trail Boston by only 41.5 games. The loss dropped New York 5.5 games back of the Red Sox in the American League East—in advance of a four-game set between the two clubs at Fenway Park. Gray is now 8-8 on the year, with an ERA of 5.56 for The Pinstriped Posers. Although, he seemed happy coming off the field.